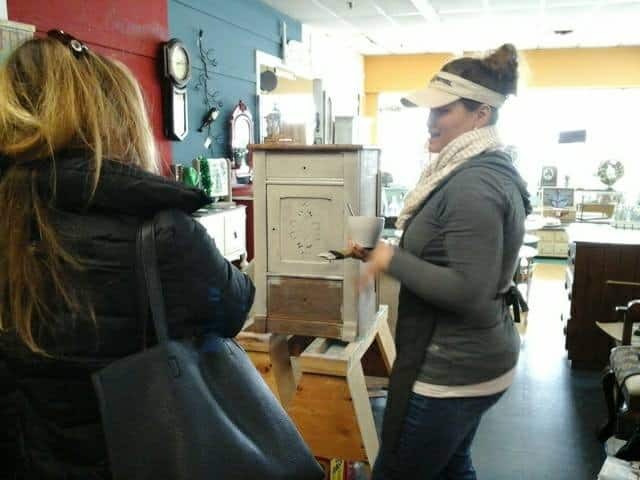 During my MMS Milk Paint demonstration yesterday down at Consign-It Furniture, there were a few folks who gathered around and asked really great questions. What product did you use to strip the top of your nightstand? How do I strip wood? What do I do first, paint or sand? Do I distress before or after I apply my topcoat? It got me thinking about how natural it is for me to work on a piece of furniture. I just know what to do first, second, fifth, and last. I’ve worked on so many projects over the years that I don’t think twice anymore. You should have seen me when I first started though! I would study Miss Mustard Seed’s You Tube videos over and over again in between phone calls at work. On my lunch break, I would look up tutorial articles on her blog and save them for when I was brave enough to pick up a paintbrush. I learned how to strip furniture from her too! This spawned the idea for this blog post. I thought it would be helpful to list the steps I go through when I do a simple furniture makeover. Start to finish, beginning to end. Here we go! This part might seem like a no brainer, but your piece has a HUGE part to play in the subsequent steps that follow. 99.9% of what I paint is wood. I don’t bother with laminate, mdf, or particleboard. I learned a while back that I don’t enjoy working on Ikea style furniture (unless it’s wood). On occasion, I may paint a metal pitcher or rolling cart. I’ve tried painting glass too but the majority of the time, it’s a sturdy wood piece of furniture. The type of wood doesn’t matter much to me. It can be one solid chunk of wood or a thin piece of veneer. Oak, maple, mahogany, birch, cedar…the species doesn’t matter either. 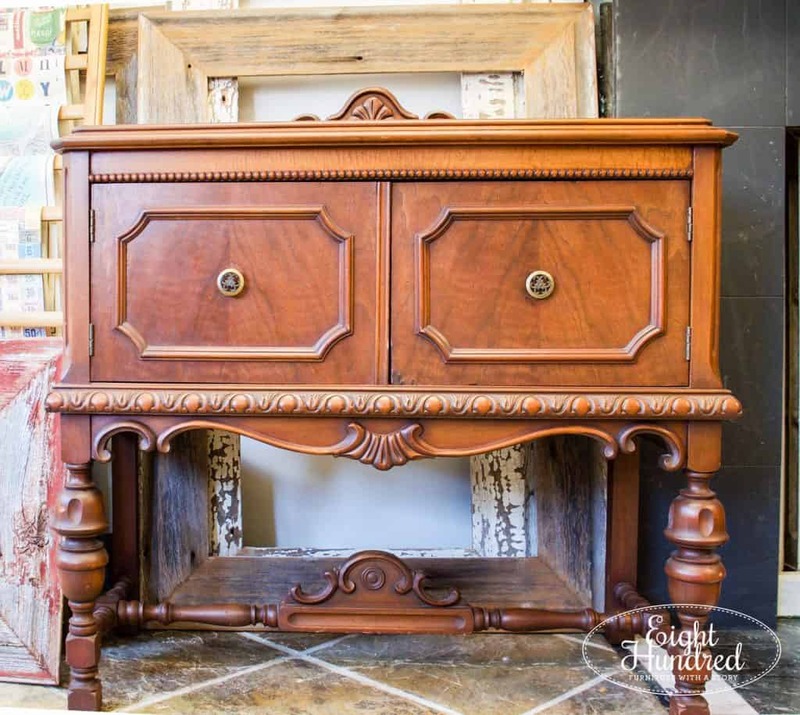 I look for pieces that are in relatively good shape when I purchase them. If they require repairs, they have to be something that I can do myself with the tools that I have. I don’t own a table saw or a router. I can’t build a new drawer for a dresser and I don’t know how to carve new legs for a table. If a piece has damage that’s out of my league, I move on no matter how good the price is. It may be a sloooooow move on, but in the end, I know I’ll be better off. Most of what I work on has been purchased somewhere else. I have little to no emotional attachment to the piece, therefore it’s easier for me to put a brush to it. There are some pieces that I own that I can’t bring myself to paint. My grandmother’s dining room set is one of them. She and my grandfather saved up their money to buy it and it’s the first major furniture purchase they made when they first got married. It’s the only dining room set they ever had and now it’s mine. I think I’ll be brave enough to paint it one day, but for now, it’s staying as-is. Because it’s packed away, I don’t have a photo of it but you get the idea. 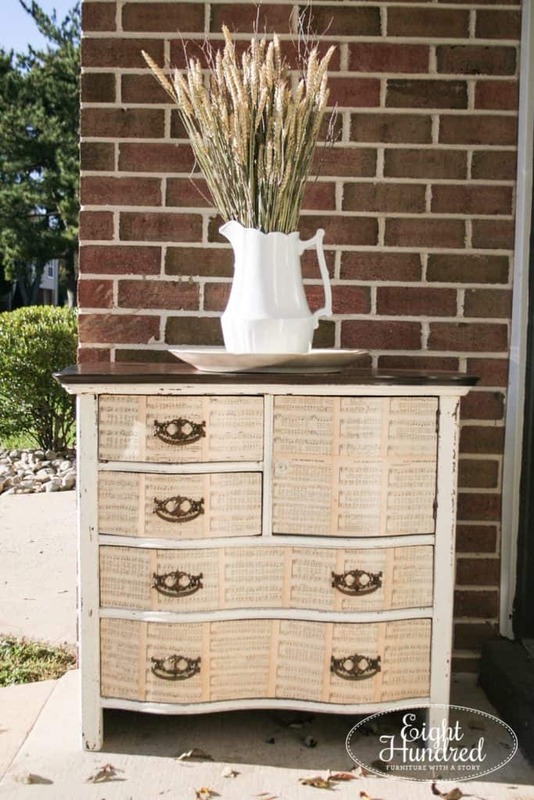 Prep is essential to a successful Milk Paint makeover! It doesn’t take a ton of time, but it will help you in the long run. 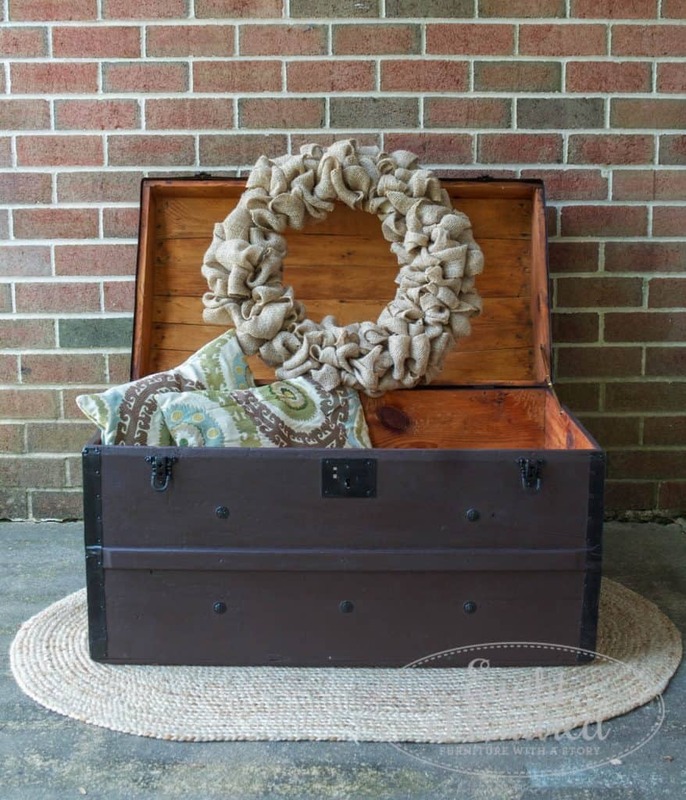 Because Milk Paint only has 5 simple ingredients, it doesn’t contain any binders, suspenders, or additives. It’s just chalk, clay, limestone, milk protein, and pigments. 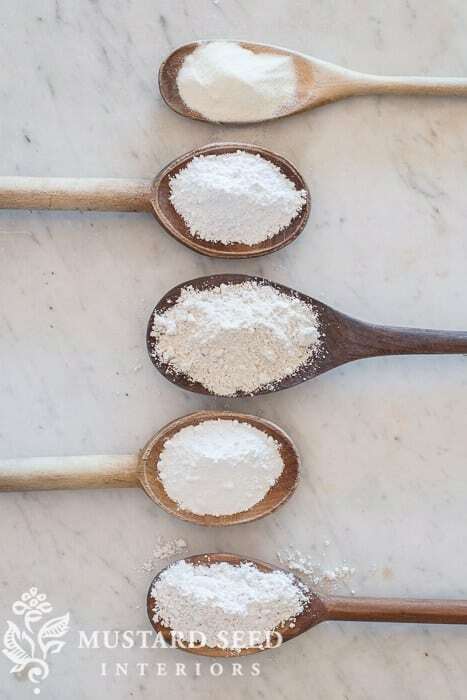 These 5 simple ingredients make Milk Paint more open to being influenced and impacted by your substrate (your project) more than a modern paint, such as Chalk Paint. 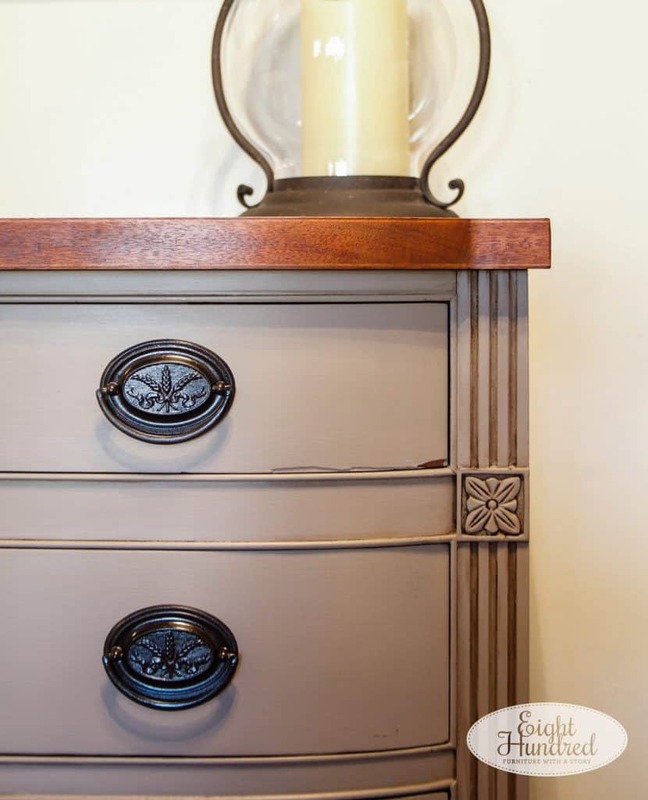 Milk Paint may chip or flake off from your piece all on its own due to something in the finish on your project. It could be oil, grease, a stain, furniture polish, or any number of other things. 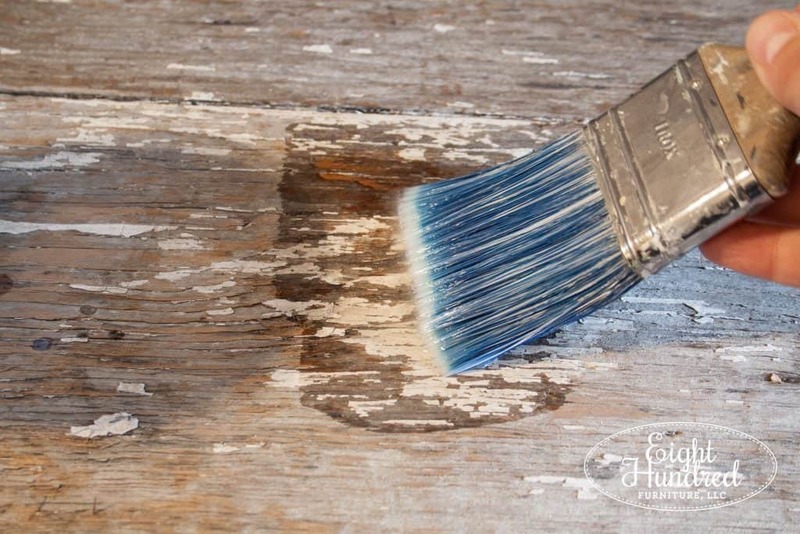 To give Milk Paint as clean of a canvas as possible, it’s good to clean your piece with some sort of grease-cutting cleaner. I wipe mine down with odorless mineral spirits and a rag. Sometimes, I use a pad of 0000 grade steel wool for stubborn spots. 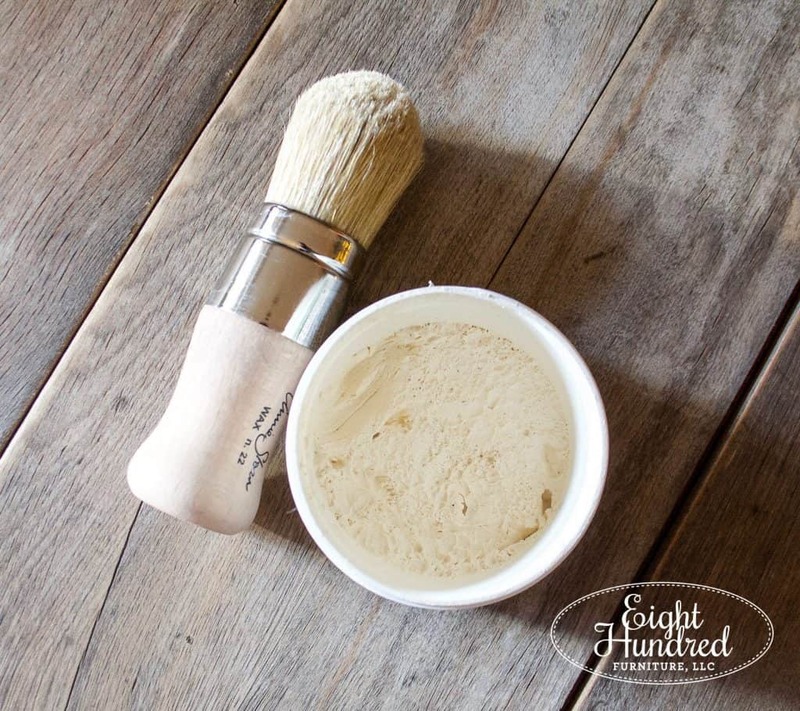 This will help get rid of any surface dirt and oils that may cause your Milk Paint to chip more than necessary. 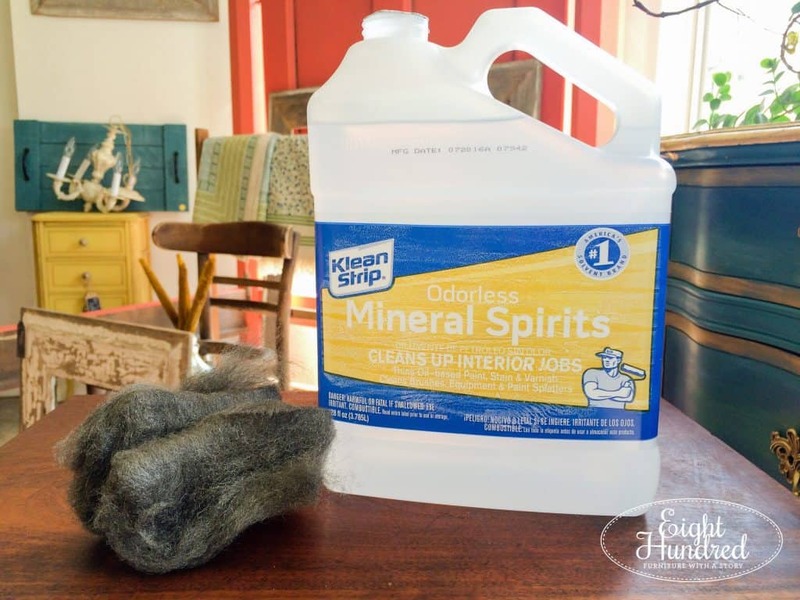 You can buy odorless mineral spirits at your local hardware store. It’s typically found in the paint aisle. I also clean out the inside of my piece with my vacuum. 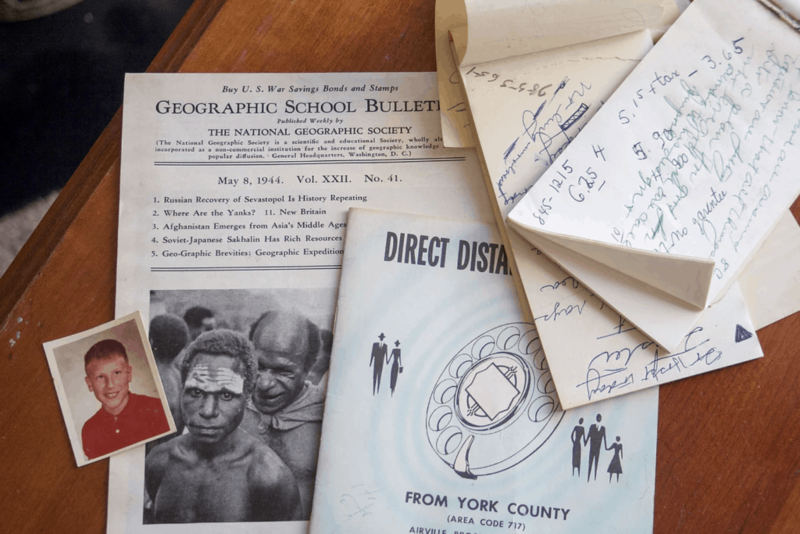 You’d be shocked at what I’ve found inside of pieces in the past – money, photos, old receipts, phone lists, old candy, hair clips, pet hair, dead bugs, spiders, cobwebs, dirt, playing cards, etc. All of this came out of one drawer in a table I was working on. Once your piece is clean and dry, you need to scuff the outside gently to give your piece “tooth”. This is not a full on sanding down to the bare wood process. It’s a 5-15 minute all over scuff to rough up your surface. I typically use between 60-120 grit sandpaper for this process. Here is a dresser that I scuffed before I painted it. 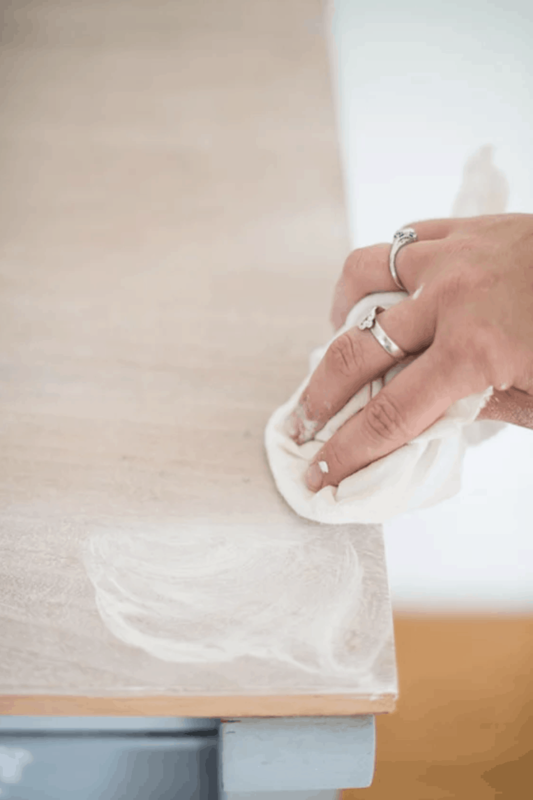 This step isn’t necessary if you’re using a modern paint like Chalk Paint or Fusion Mineral Paint. They’re formulated with binders and extra add in’s so you don’t have to take this step. 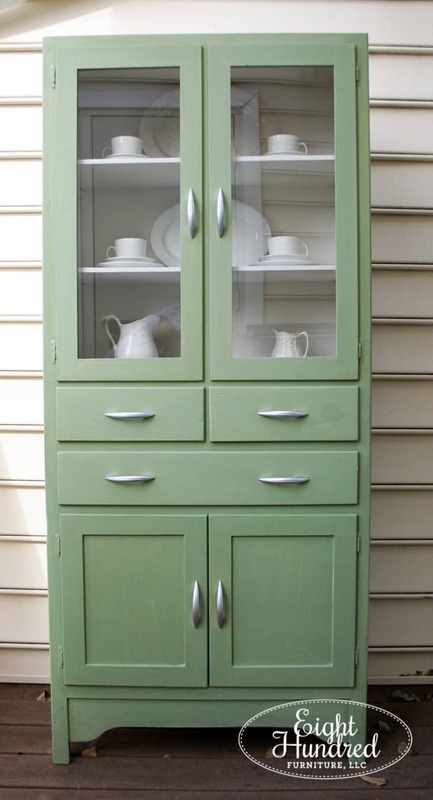 Because Milk Paint is as broken down and as close to natural as you can get, it requires a little more work up front. It does have other qualities and benefits that other modern paints don’t, so it’s a give and take. Sometimes, I’ll completely disassemble a piece before I start painting too. I’ll unscrew hinges from doors because I don’t want them painted. I’ll lay drawers out to paint them separate from the body. Other times, I’ll leave the doors on and paint right over the hinges if they’re not fancy. I usually take the handles and knobs off though. Once everything is prepped and removed, it’s time to paint! I could do an entire blog post on mixing Milk Paint. 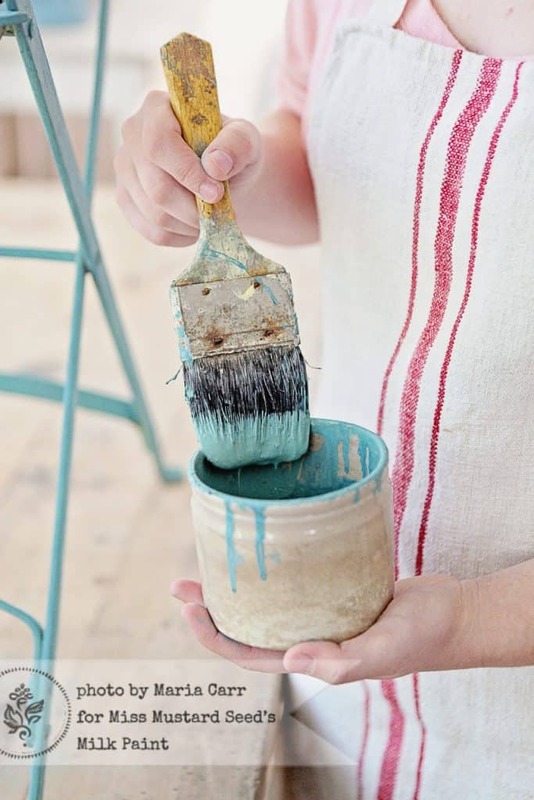 You can read up on tips for the mixing process on the Milk Paint blog by going here. For now, I’ll stick to discussing the painting process in general. I typically do not use painter’s tape when I paint. I’ve gotten used to holding a paintbrush and can make a steady line if need be. However, if spaces are tight or if I’ve just refinished a top, I’ll tape it off to protect my stain from paint. 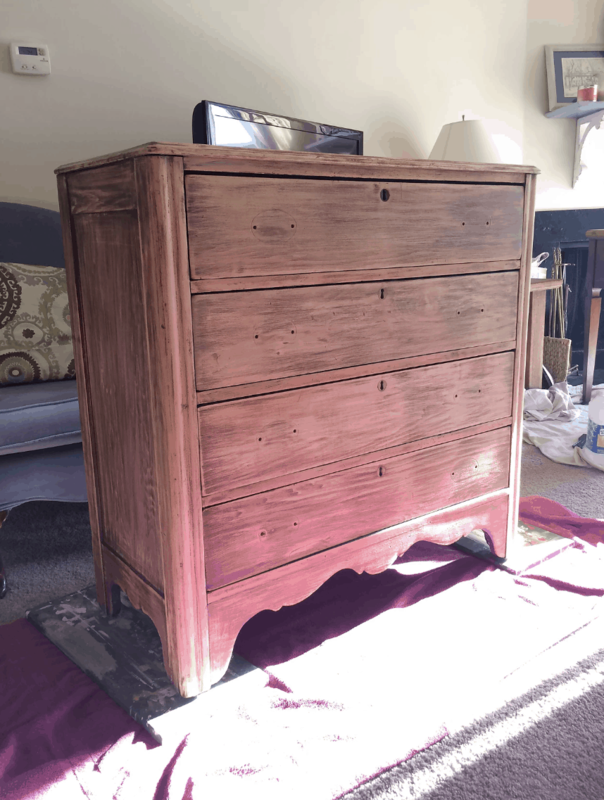 Your first coat of Milk Paint will look ugly. There’s no other word for it. It will be streaky and uneven. You’ll wonder why you even started! Have no fear because that’s totally NORMAL! In this photo, I only have a second coat on the top two drawers. Everywhere else just has 1. Can you see the difference? Here’s another comparison from my Marzipan trunk. The left side just has 1 coat and the right has 2. 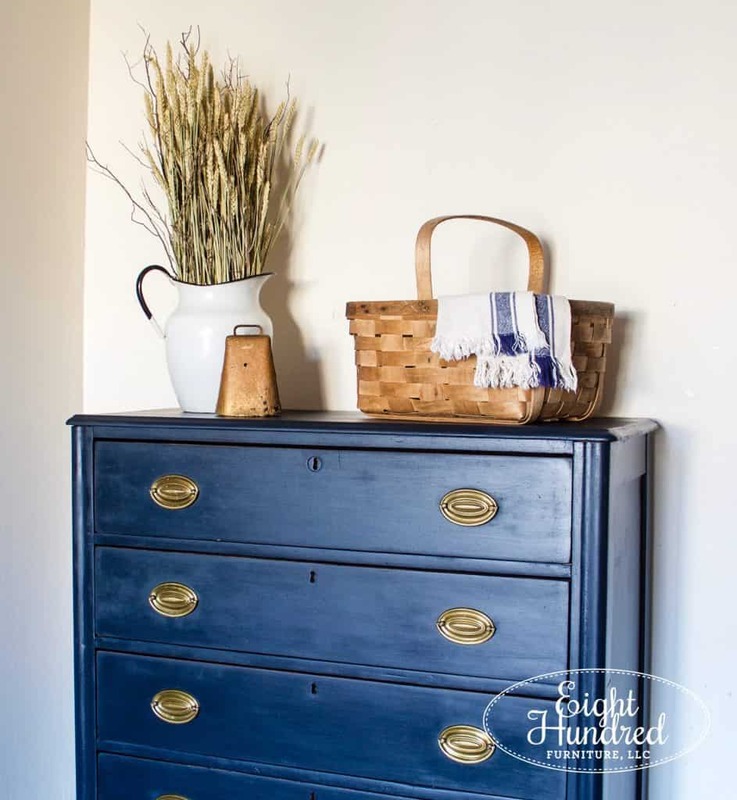 Milk Paint is a fantastic paint to use if you’ve never painted furniture before because it is super forgiving when it comes to brush strokes. Matter of fact, there aren’t really any visible brush strokes when you’re done. 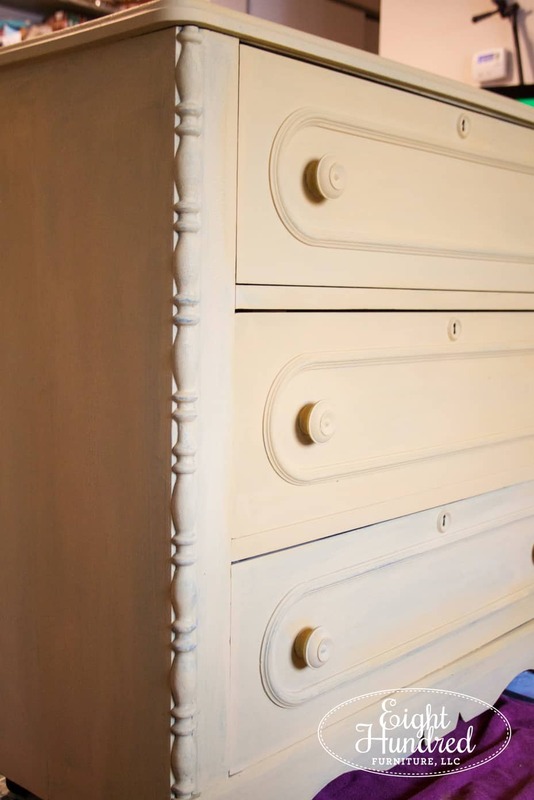 The reason is because Milk Paint acts more like a colored stain than a paint. It absorbs into your piece rather than drying in a layer on the top like latex. You don’t need a fancy brush or any special technique to get amazing results. Just brush it on and go. How many coats you’ll need depends on the color you’re using and how it’s absorbing into your project. Typically, darker colors need 2 coats and lighter colors need 3. There are exceptions to that rule of thumb but that’s generally the case. I have yet to encounter a paint that can 100% completely cover in just 1 coat. If so, it’s probably a really thick coat and you’ll get drips. I don’t know how to paint that way, and it’s better to do 2 thin coats than 1 thick one, in my opinion. I’ve heard people say they, “don’t have the patience to paint furniture”. They want it done as fast as possible and be over with it. I’ll tell you right now that rushing will give you results that look like you rushed. You have to take your time and do it right if you want your piece to look its best. If you rush, you’ll mess up. I guarantee it because I’ve done it. It’s not worth it. Just take the time you need and if it takes you a week to finish one project, then it takes a week. The furniture police aren’t going to come get you! I’ve taken months just to finish one piece because life happens. You get busy and you just can’t get to it sometimes. Now that this is my full time job, I can’t take that long to finish something, but when it was just a hobby, I had that luxury. Once your piece is painted, you can distress. I typically distress BEFORE I apply my finish/topcoat. 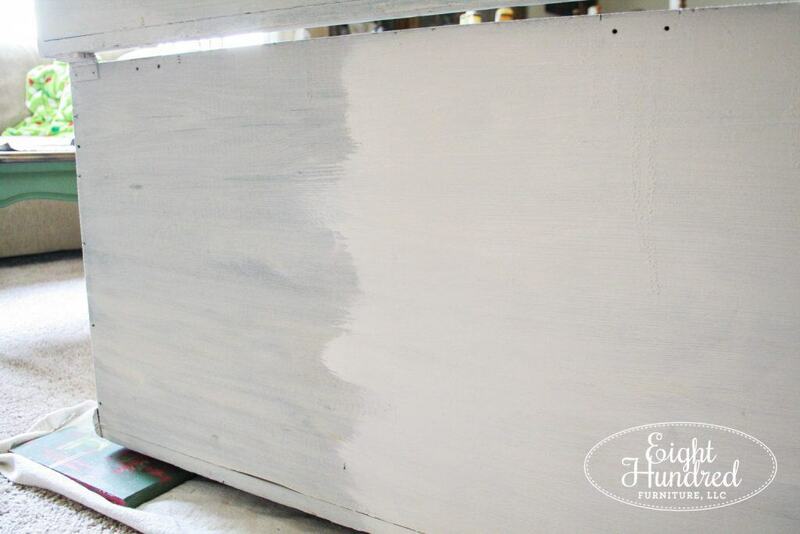 Distressing is the process of removing paint from your piece to simulate the wear and tear of time. I typically go over my entire piece with 400 grit sandpaper to smooth it down. Then, I come back with anywhere from 100-220 grit sandpaper and hit the edges to distress. You can check out my tips for distressing in this video. I don’t always distress my furniture. Sometimes, I want to go with a full coverage look instead of chippy and distressed. There’s no right or wrong way to distress. I just encourage you to go for what looks natural and what suits the piece best. 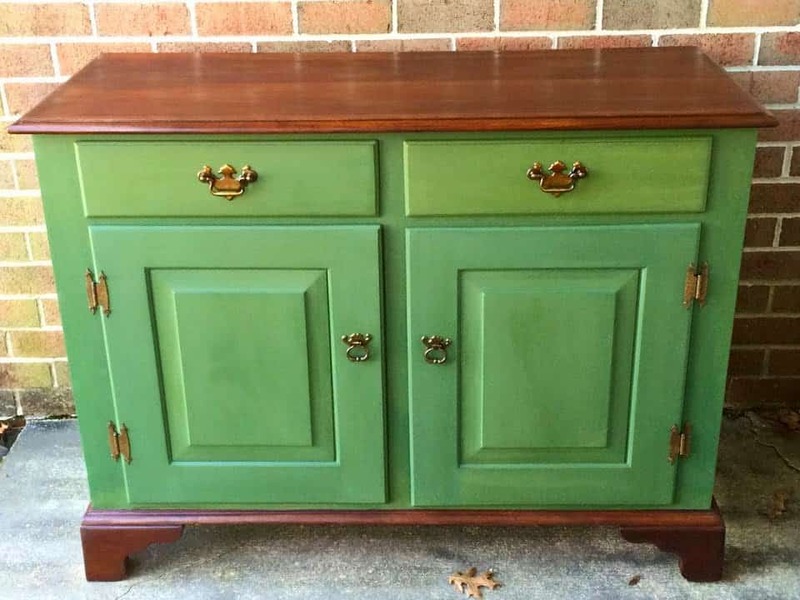 A mid-century modern table wouldn’t look quite right with chippy paint, but a full coverage look on a primitive step back hutch might make it look a little too new. Once you’re done painting, it’s time to seal your piece. 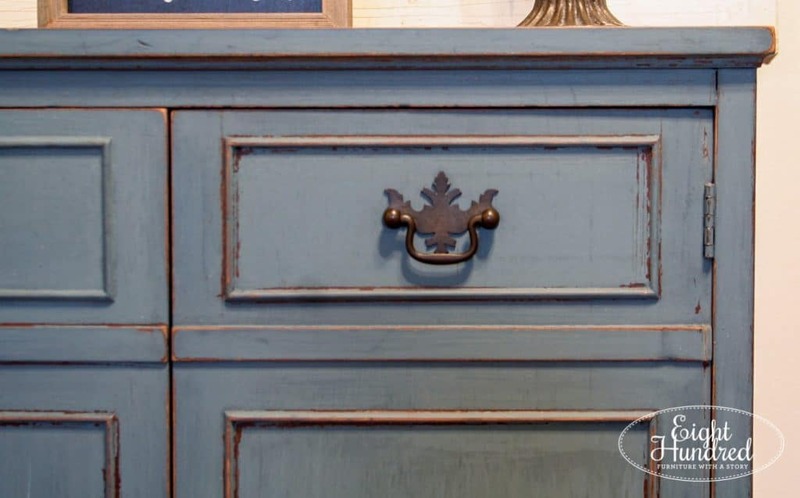 Miss Mustard Seed’s Milk Paint has 4 finishes to choose from, and you can read about them here. I won’t go into the particulars of how to apply each finish, or what you use them for for the purposes of this post, but you have lots of options to choose from! There are waxes, oils, and water based topcoats and each has its own unique features. Most topcoats are applied with a brush and the excess is wiped off. Water based finishes need to be applied and left alone – no wiping. HA! Thought you were done? Most people do after applying their topcoat. Your piece is all sealed and now it’s time to use it. 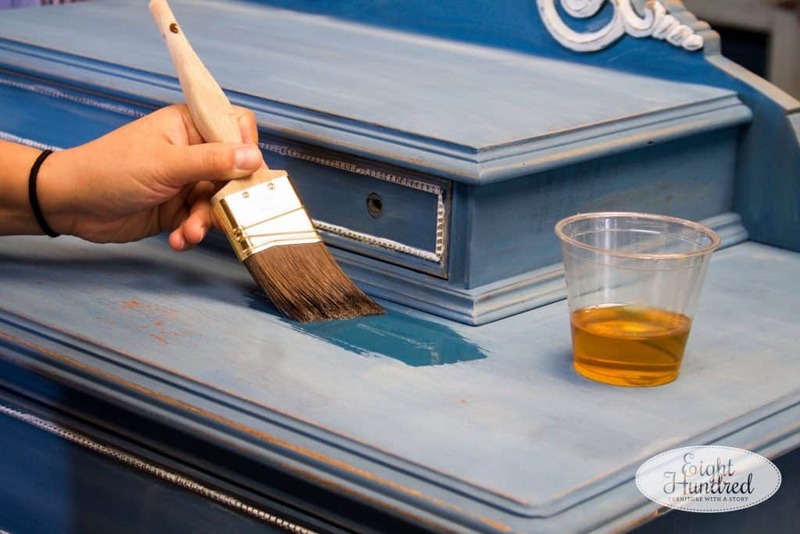 Most damage occurs to furniture within the first 20-30 days after painting because the piece hasn’t had enough time to cure. It may feel dry to the touch, but it hasn’t fully settled into its most durable state yet. That process takes about 30 days. Yes, you read that correctly. 30. FULL. DAYS. 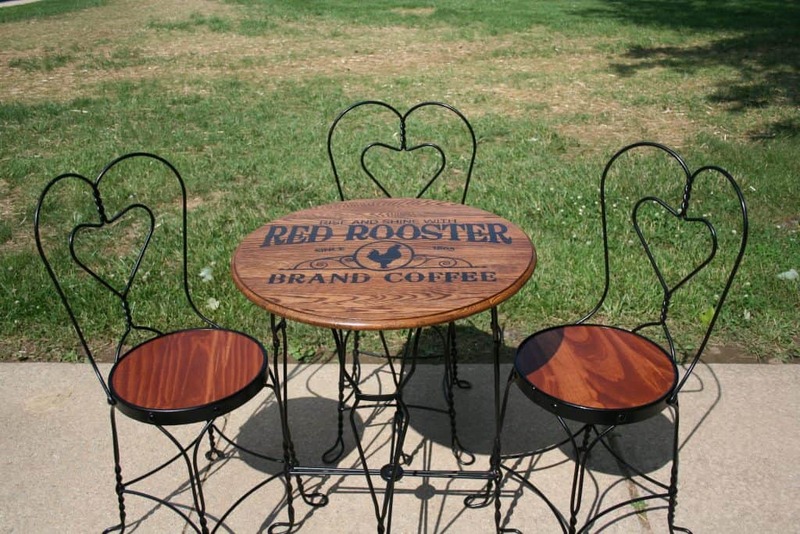 So if you refinish your kitchen table, you really shouldn’t use it for the next 3-4 weeks. It’s paper plates on the coffee table for a bit. That dresser you just hemp oiled? Don’t put a lamp or your alarm clock on it for 3-4 weeks. Be gentle when opening the drawers. Keep your cat off of the top. Your picture frame you just used Antiquing Wax on? Let it sit before you hang it on the wall and put a picture inside. 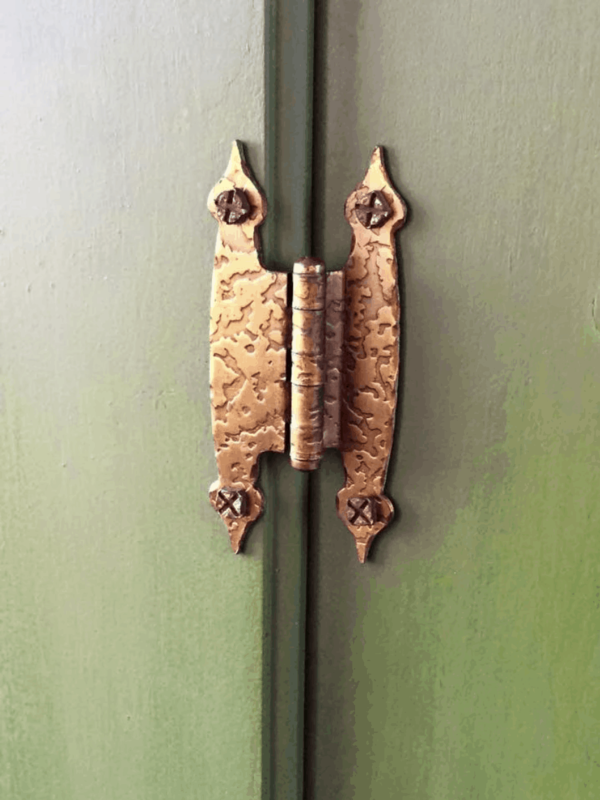 Now before you think that Miss Mustard Seed’s products take too long to cure, this time frame is standard for any product on the market, whether it be Miss Mustard Seed or Annie Sloan or General Finishes. Read your labels. All paint products need a good solid 20-30 days (3-4 weeks) to fully and completely cure. You can read more about the difference between dry and cure time here. If you’re a furniture seller like me, you need to be extra careful not only transporting your pieces to and from your studio and retail space, but in staging and even educating your customers about cure time. Explain that the proud new owner of your Mustard Seed Yellow cupboard shouldn’t put any of her antique quilts inside of until the Hemp Oil has had time to cure. The new couple that just bought your freshly waxed chairs shouldn’t sit on them for a few weeks. There’s that whole patience thing again. It may seem like a pain, but if you’ve taken the time to paint a piece, don’t ruin it with impatience! I hope these steps have helped you get a feel for the flow of how a furniture makeover is completed. For more tips and advice, email me ateighthundredfurniture@gmail.com or search my blog for other articles about painting furniture.